After spending time in Los Angeles, the girls next stop is Miami where the weather is hot and the men are hotter. To understand what is going on you have to read the first book in the series as it give you a bit of background on all of the three girls and their reason for this summer trip. Otherwise the story may not make so much sense. You can see my review of Trouble In Tinseltown here. 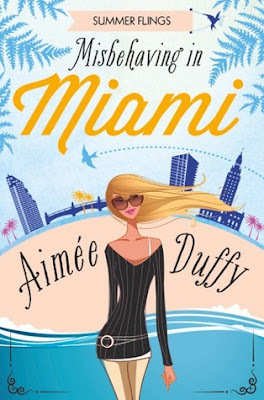 Ciara had a fling with Zack who just so happens to be Elle's cousin but leaving him back in LA, she never expected to see him again until he shows up in Miami, surprising her. Ciara isn't looking for anything serious, she just wants some summer fun before going back to her life at the end of their trip but Zack is getting more and more harder to resist. Elle and Gem are more focused on the shopping part of the trip than the men, as they both come from money they don't have any trouble splashing cash on things they want but Ciara is more sensible with the money she does have. There are a lot of small issues that Ciara develops throughout this part, her feelings for Zack and the fact that she doesn't want to turn into her mother as she has tried hard to follow her own path but now she doesn't know what to do. Misbehaving In Miami is exactly that, three girls misbehaving in Miami having fun and flirting with cute guys who make great entertainment for all of the girls to have in the marvellous Miami. With fantastic shopping, dazzling clubs and three best friends, it is clear that this is going to be a memorable stop on their summer of fun.